I thought the cliffhanger to the previous issue really kicked things up a notch…and I was right! 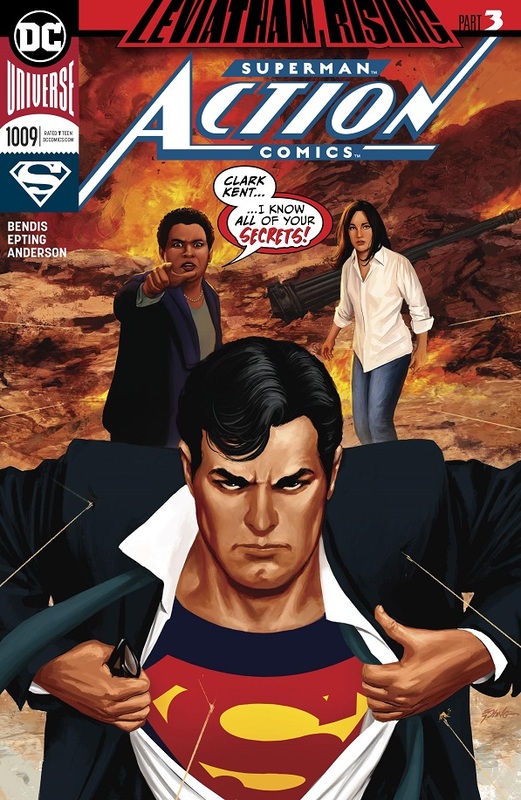 Superman and Lois have taken Amanda Waller and Jimmy Olsen to the new Fortress of Solitude to try and figure out what’s going on. 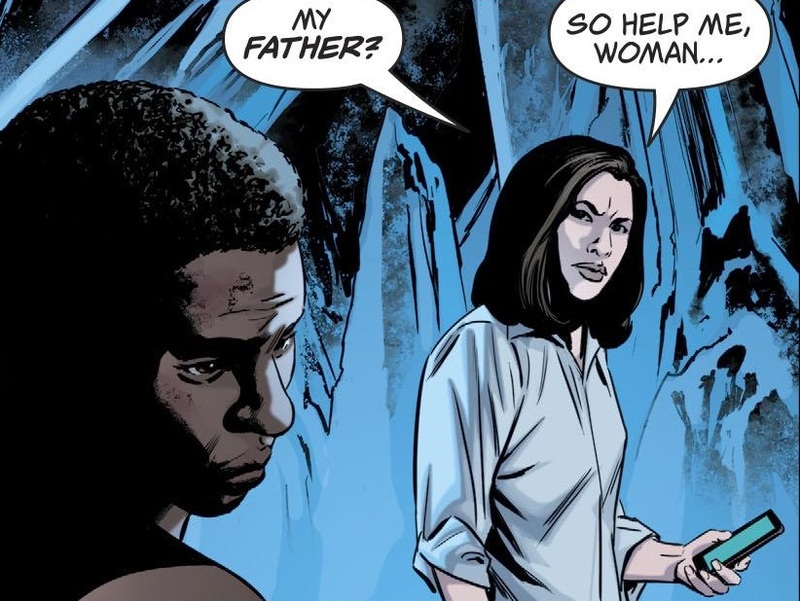 Waller can’t help but keep needling Lois, but she does explain that she thinks Leviathan is behind everything (and it is the Leviathan we already know, the one that Talia al Ghul runs). When Waller tells them that Lois’ dad is in the hospital, Superman flies out to check on him (and finds the Question in the hospital room, also investigating everything). Superman then checks on Leviathan HQ, which is abandoned. 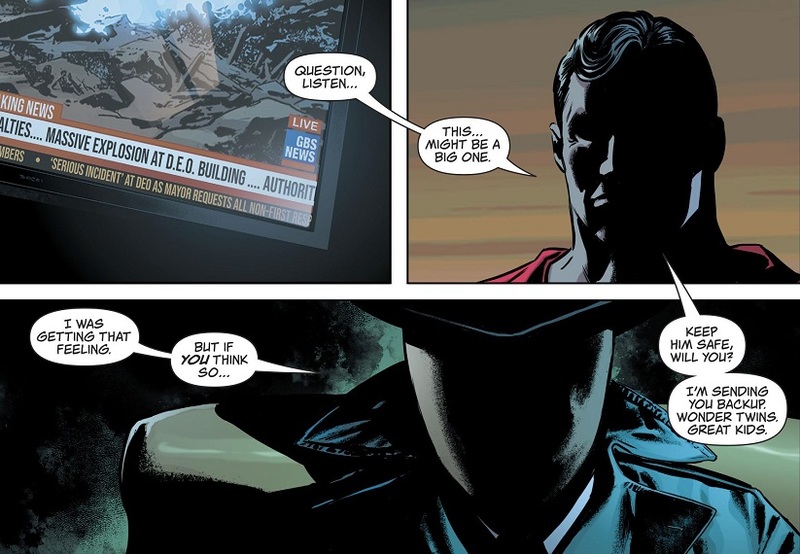 He delivers some Leviathan evidence to Alfred in the Batcave, and he checks on Bones at the former DEO base. Bones refuses his help, but doesn’t know where Adam Strange has gone. Meanwhile, Waller needles Lois just enough that Lois clocks her one! And Jimmy Olsen wakes up. He’s pretty chill about being in the Fortress of Solitude. Superman eventually returns and everyone continues sharing notes. Waller explains that Spyral might have something to do with this, which prompts Lois to start shouting the name “Chaz!” at Superman. Clark pulls Lois aside and she takes out a special Kryptonite that transforms Superman into another person. Then Superman calls up Spyral as this Chaz Donen, agent of Spyral! Lois and Clark have double identities as secret Spyral agents! Bendis is doing a really good job of building the tension on this crisis. It’s hampered somewhat by this being the same Leviathan and Spyral we’ve seen a lot of lately. They were major players in Grant Morrison’s Batman comics. But I suppose Bendis is welcome to wring new excitement and evil out of them. How many times have Marvel writers remade Hydra into something new and deadlier than the last time? But yeah, I really enjoyed Superman flying around the world checking in with certain parties, and how it built the tension. The scene with the Question was great. I especially enjoyed Lois Lane putting Amanda Waller in her place five times from Sunday! I loathe Amanda Waller, probably for all of the reasons you’re supposed to dislike Amanda Waller. But I dislike her even more than that, and seeing Lois Lane own house was phenomenally fun. As was seeing Lois and Clark work so well as a team. Bendis writes their husband/wife rapport so well, it’s delightful! Such a treat at the heart of this comic. And that ending was just so silly and fun! Bring on this craziness! TL;DR: The tension keeps mounting and the story keeps getting better as Bendis sinks his teeth into something more enjoyable. Oof. I don’t know what’s happening with Fantastic Four, but Marvel shouldn’t be stumbling on one of its premiere books so soon. Doctor Doom has not only captured Galactus and is mining him fro the Power Cosmic, he’s also put the Fantastic Four in individual death traps. He takes some time to gloat to all of them before going on television to announce to the world that the Power Cosmic will help turn Earth into an intergalactic super-power, and he’s going to kill the Fantastic Four as foreign agents. Of course, Doom has underestimated them and Sue uses her power to make Doom’s armor and clothing disappear on live TV. So he’s naked to the world! And he’s pissed. Meanwhile, Franklin has a nightmare about all the aliens he left behind and how the Griever is gonna kill them all. So he storms out in the middle of the night, including using Alicia’s blindness against her by just slipping past when she tries to stop him. He goes for a walk and is found by a little girl named Wendy, who an editorial note tells us appeared way back in Fantastic Four #239. Wendy has some weird and mysterious friends in town, and she’s a big FF fan, so she hurries Franklin to her house to watch Doom’s broadcast. Four different artists? 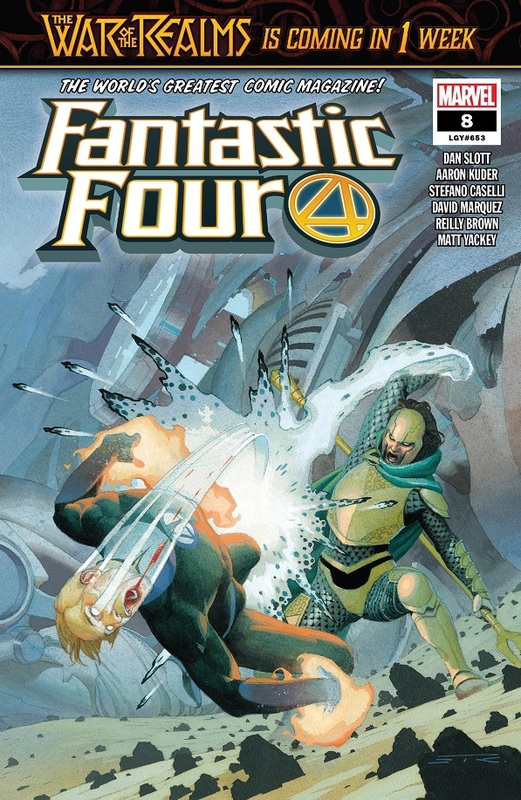 The production of Fantastic Four is going so wrong that Marvel needed to whip together four different artists at only issue #8? Normally I probably wouldn’t comment on such a thing, since I don’t know much about comic book art, but the jumbled artists effect the overall flow of the comic. It makes the whole thing feel…cheap. The primitive nature of the story doesn’t help either. Doctor Doom puts the Fantastic Four in elaborate death traps? Then underestimates them in rather simple ways so that they defeat him? And then the big climax and wicked cliffhanger is that Sue reveals Doom’s scars and dingle berries to the cameras? This issue feels like a simplified, all-ages Fantastic Four comic. Like Marvel put out a special kid-friendly imprint to sell at Scholastic Book Fairs. I don’t think that’s how Reed’s beard would stretch. If you zoom in, it’s clearly drawn as if stretching Reed’s chin created more spots for beard hair to grow…but wouldn’t him stretching increase the space between beard hairs? I need a canon answer! The story feels like it should have stakes, but they don’t materialize. Doom’s Galactus plan is big and could be interesting, but then it’s immediately undercut by the tired trope of Doctor Doom foolishly putting the Fantastic Four into elaborate death traps. And it doesn’t matter how many times Doom tells the F4 that these death traps are different and better, everybody reading this knows they’re not going to stick. And when Doom declares he will take good care of Franklin and Val, you remember that both of them are teenagers now and are fully capable of defeating this buffoonish Doctor Doom. Doom’s new sidekick Victorious also sticks out like a sore thumb. The idea that Doom would present her as anything resembling an equal feels off. Plus, her clear attraction and interest in Johnny Storm is so obvious that it robs the whole storyline of any real emotion. Which is a real shame, because I love a good romance in comics. Points for digging deep into FF history and finding that Wendy girl to bring back. I love that kind of stuff. TL;DR: Way too many artists and a storyline that’s just a bit too broad hamper would could have been a pretty cool issue of Fantastic Four. Huh, so Blue Beetle was real. There goes my one good theory about this comic. At any rate, I’m ready for this to be over, even if this was one of the better issues. The testimonials this issue are all about Wally West going through three weeks of Sanctuary treatment. He talks about his family, and how he owed his entire superhero career to his Uncle Barry…until Barry caused Flashpoint, which erased Wally’s family from existence. Oops! And how Wally was really coming into his own after a long time as the Flash when DC decided to bring Barry Allen back. Double oops! Meanwhile, Harley Quinn and Batgirl take on Booster Gold and Blue Beetle, with it mostly being Harley attacking Booster. But when the time comes to deliver the killing blow, she can’t do it, and collapses on the floor next to him. They’re both screwed up. Then Beetle shares what they’ve learned about Wally West being five days older than everybody else, so the four of them decided that they’re going to under-the-radar save Wally and save the world. Though Batman and the Flash are starting to catch up to them. Double meanwhile, Wally was the one to recover the rose that Harley dropped off the bridge to memorialize Poison Ivy. He plants the rose and it grows into Poison Ivy. He apologizes for hurting her, and that this doesn’t make up for what he did. Then he apologizes for making her watch his death…and a second Wally West appears. 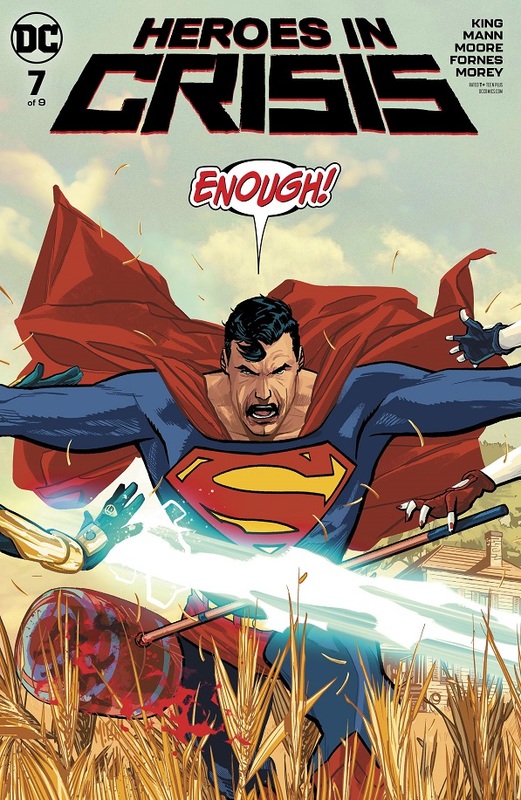 I’m just ready for Heroes in Crisis to be over. I’m open to the idea of King having a huge, amazing ending that ties everything together and makes this whole series worth it. But this murder mystery is really dragging on. I just don’t care anymore. I like the idea that it was Wally West. I like the idea that King has taken everything that Wally has been through editorially since the Pre-52 and Flashpoint to point out that Wally should really be more messed up by it all. That’s solid character development…even if it means sacrificing Wally West as a character. But then I was never a big Flash fan, so it isn’t bothering me as much as it might bother someone for whom Wally was their favorite character. But I like the idea that King thought this out, that he took a look at DC’s overall treatment of Wally over the past few years and realized that could really work for the character himself. So I’m on board with King delivering some kind of freaky Wally West time travel revelation to tie this all up. It probably won’t mean Heroes in Crisis is good overall. But at least when King focuses on the mystery of it all, and the interesting revelations, it makes for a readable and somewhat enjoyable issue. TL;DR: The new issue focuses on the mystery and the solving of that mystery, making for a much stronger issue than when King and Co. try to be all metaphysical and poetical. Rogue takes a trip through her subconscious to try and figure out what’s been wrong with her control over her powers all these years. She visits all her “greatest hits” moments, and with the help of some mental teamwork, she figures out that fear has been the cornerstone for her lack of control. Meanwhile, Gambit uses his super thief skills to break in and steal Spiral’s treasure: a baby with six arms, like her. On his way out, he’s recognized by the denizens of Mojoworld (who watch all of the X-Men shows), and they ask for his help in overthrowing Mojo. Gambit then rejoins Spiral as she fights to keep Rogue’s unconscious body from being attacked. Then Rogue wakes up just in time, assuring Gambit that she’s figured it out! Then Mojo shows up. This wasn’t the strongest issue of the series, but it was still really good. I just can’t help but shake the feeling that this explanation for Rogue’s powers feels a little rushed. 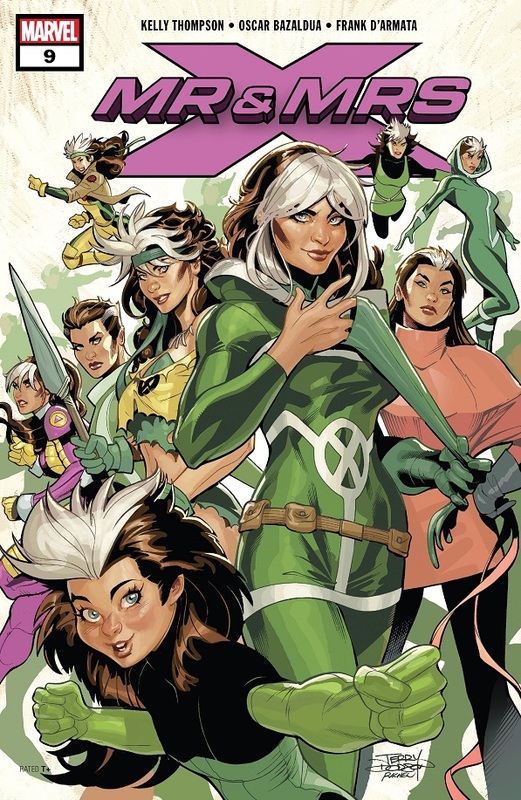 I haven’t heard anything about this comic getting cancelled (such is the fate of Kelly Thompson comics sometimes), but it would make sense that Marvel would want to establish this for Rogue before they’re forced to quietly end this great series. It’s just that this “fear” issue hasn’t been set up at all in the series so far. At least not to a degree that I’ve noticed. I like the fear answers overall, and how Thompson handles the explanation through Rogue’s psyche. It works in the long run. 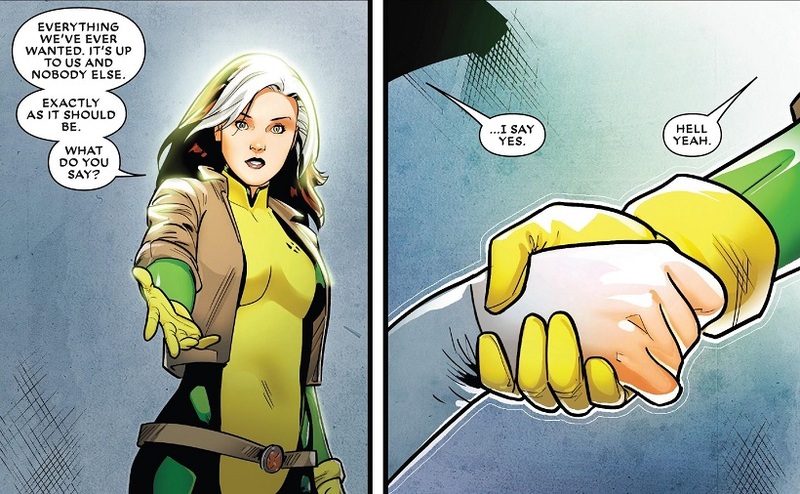 I just would have liked if Rogue’s fear had been an ongoing theme of this whole series, building up to this moment. It was only a few issues ago that Thompson gave that new, deadly power to Rogue. She’s barely had time to use that power or process the change, since we jumped right into the Mojo storyline. And now Rogue has already figured out the problem at the very core of her powers. It’s a bit of a leap…which makes me worry that Marvel wanted Thompson to cram this explanation in somewhere quick. But we’ll see. Overall, the issue is enjoyable. I still really like Bazaldua on art. His shots of Gambit being stealthy and cool are really fun. And this is one of Thompson’s strongest character-based comics. I hope it doesn’t get cancelled too soon. TL;DR: Another fun and enjoyable issue of Mr. & Mrs. X is hampered by the slight feeling that this comic is being rushed. 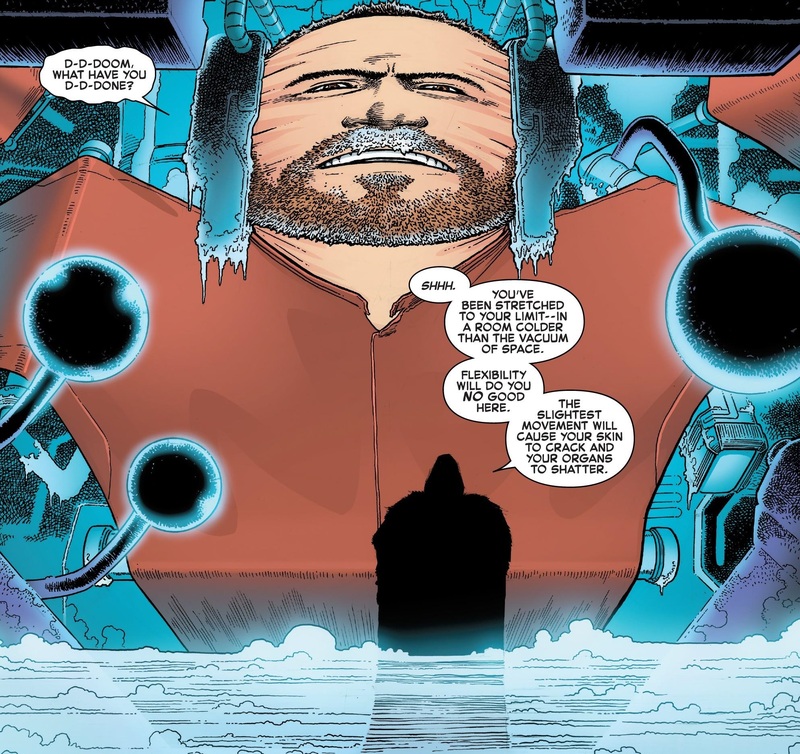 Posted on March 30, 2019, in Comics, DC, Marvel, Reviews, Superman, X-Men and tagged Action Comics, Fantastic Four, Gambit, Heroes in Crisis, Mr. & Mrs. X, Rogue, Wally West. Bookmark the permalink. 5 Comments. Agreed on Mr and Mrs X. And the reason for her lack of control seemed kind of obvious. Not exactly mind blowing. Haven’t we done this before? I was a huge Thompson fanboy after #1, but the excitement has fizzled. I haven’t enjoyed WCA much. 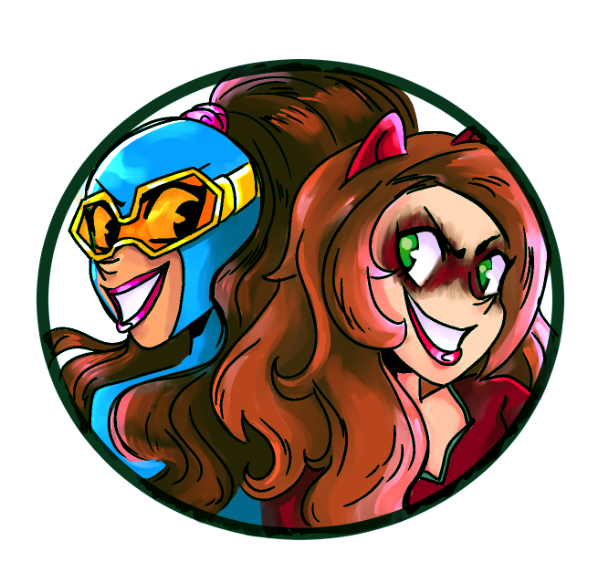 I don’t know enough about Rogue to know if we’ve been here before or not. I wasn’t paying attention at all through her Uncanny Avengers phase, and that was several years. I feel like it was before that, when she was working with Xavier. But maybe I’m thinking of Elsa from Frozen, because it’s a very similar issue. I wonder if Ms. Thompson thought about that. FF was OK. But there wasn’t actually much tension, because it was just Doom gloating about how brilliant he is while the FF basically make wanking motions. Not even they can take his death traps seriously, so why should the reader? Mr. and Mrs. X is great. Really nice dive into Rogue’s feelings and history. Yes, that’s exactly how I felt about FF! Such a weird story element.